CHRC Goes Camping – Again! Curious what a CHRC camping trip is like? Heather Strickland tells all. I love camping. Something about the fresh air, the campfire, and the mild danger of being eaten by bears really makes my heart sing. So when our fearless camp captain Sunny started gathering the names of people who might be interested in a weekend in the woods, I eagerly put my name on the list. 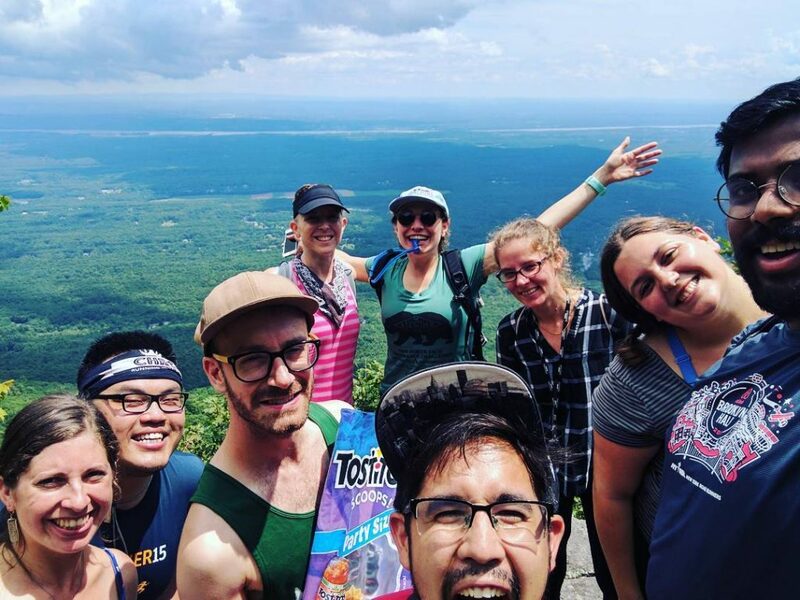 And at 7am on July 8, nine CHRC campers and a bag of Tostitos Scoops packed more than should be humanly possible into two cars and made our way to the Catskills. First on the agenda: hiking. On the way to the campground, we stopped for a morning hike up to Boulder Rock and Inspiration Point. The ground was a little damp but our spirits certainly weren’t. We passed lakes, climbed rocks (Gideon and Anna hoisted themselves onto Boulder Rock itself), jumped over crevasses, and tried to convince a group of kids that there were polar bears in the mountains. After hours in the woods and some beautiful sights, we were famished. Fortunately, we’d passed a general store/ice cream shop on our way to the trailhead, so we drove a half mile up the road and grabbed two picnic tables to enjoy lunch, with an appetizer of soft serve. Aliza and Sunny did a KILLER job grocery shopping, and I had what I’m going to call the best sandwich of my life. …and that’s when the rain set in. We huddled under the picnic umbrellas to stay dry, and passed our bread between tables under towels to preserve the integrity of the loaves. Spencer protected (and ate) the Tostitos. We waited for the rain to pass, and hoped that our campsite would be dry. We arrived at our home for the evening, Magic Forest Farm, a few hours later. Our site had a fantastic view. Though it was a little muddy, we were able to get a nice fire going in our elevated fire pit. Chef Sunny, assisted by his sous chefs (aka everyone…we had some amazing team work! ), started marinating chicken and chopping up veggies, and we set our tents up in shifts. Louie’s tent looked like a weird little space pod. Sunny and I both brought hammocks and set those up near the fire. A well-known fact about runners is that our appetites are…very, very good. Even after our giant lunch, we managed to devour our chicken, veggie, corn, and potato dinner. After dinner, Sunny had us play a game where we shared something we admired about each other and our wishes for each other for the future. Considering that I walked into the trip near strangers with some of the group, it was wonderful to go to sleep that night having made real friendships. Danielle broke out the s’mores and we all swapped stories. Some people went for a late night walk, and others turned in early. It was such a beautiful night, if a bit chilly, and the crickets were calling, so I abandoned my tent mate Shelley and dragged my sleeping bag out to my hammock to sleep under the expansive night sky. In the morning, a group of us went for a trail run. We got a little turned around by the muddy trails and giant hills, and we intended to go for 5 miles, but only ended up going 3. But at the end of the trail we found goats, ducks, chickens, and cows, and hanging out with our new farm friends made the missed miles totally worth it. Back at camp, Anna was making pancakes. We cooked up some eggs, fried potatoes, and tortillas, and had an incredible breakfast feast. Gideon slept through most of it. As we piled back into the car to head back to the city, I was so thankful to Sunny for arranging this trip, so happy to have met my CHRC crew, and so excited to do this all over again.